What was the first thing you remember eating? What’s the first thing your remember cooking? When we talk about favorite, comfort foods the conversations almost always turns to foods from our childhood. Those yummy dishes that our mom’s and grandmothers, use to make for us. These food memories shape our path’s as eaters and predict where our stomachs will lead us in the future. This past month this idea of food memories was brought to light for me in both in film and a cooking class. Yesterday afternoon I saw 100 Foot Journey a film produced by Steven Spielberg and Oprah Winfrey. Let’s call it, what it is, a feel good food movie! It doesn’t hurt that it was set a in picturesque French countryside, with gorgeous food shots, from bubbling, spicy Indian delicacies to perfectly composed French plates of pigeon and truffles and an all star cast. The plot was simple, but the beautiful food shots and message is what made me fall for this movie. In the end adding mom’s special spices to traditional dishes proves to be a sensation and where all food memories begin and end. I am a huge Iron Chef, Top Chef and Stonewall Kitchen fan, and recently attended Chef Edward Lee‘s New American Cuisine cooking class at Stonewall Kitchen. Chef Lee is self described, one part Southern soul, one part Asian spice, and one part New York attitude. He embraces this concept food memories in his cookbook Smoke & Pickles. His recipes, restaurants and cookbook reflect that overlapping flavors and techniques from his Korean background and combined with traditional yet unique southern cuisine, this unlikely combination is a winning one. Chef Lee is not just an amazing cook, he also has a knack for story telling. All his recipes are combined with entertaining stories of his life and culinary journey. 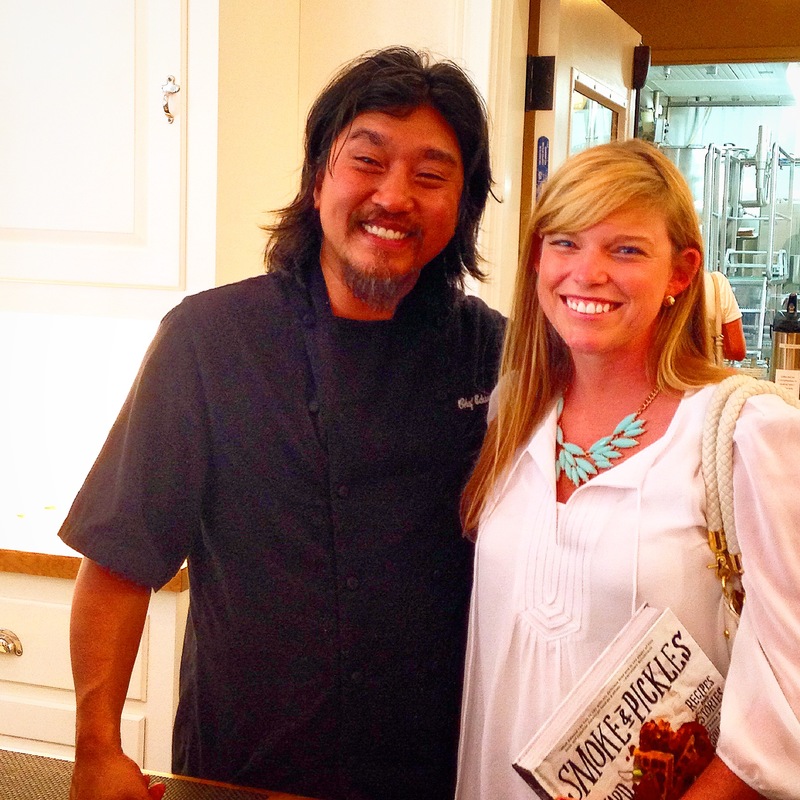 Chef Lee left a mark in me with one piece of advice and one recipe that will become part of my food memories. First his advice is a simple, sarcastic and straight forward as he is. Good food is meant to take time. Finally the food! 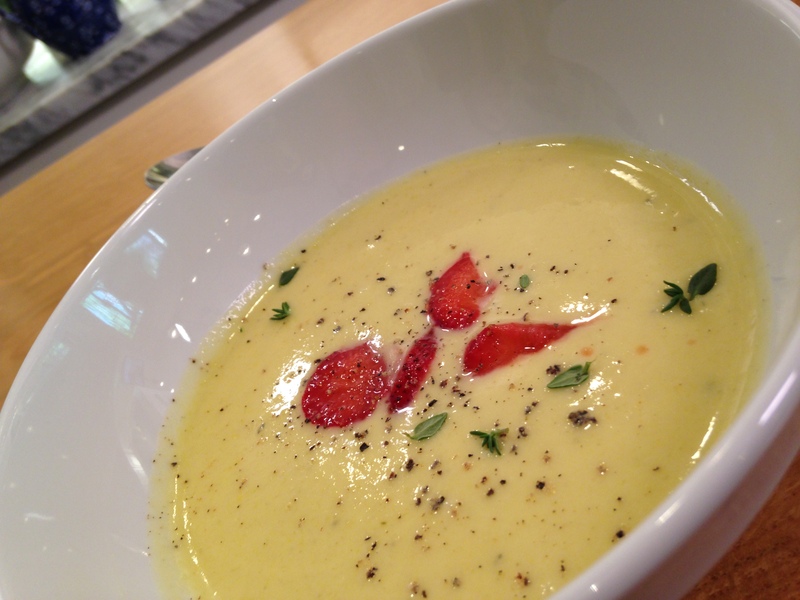 The Yellow Squash Soup with Cured Strawberries brought back a flood of memories for me. Chef Lee described the dish as a refreshing soup that tastes like Summer in a bowl and for me that is exactly what it was. Yellow summer squash is the first vegetables that I can remember that I truly loved and enjoyed. 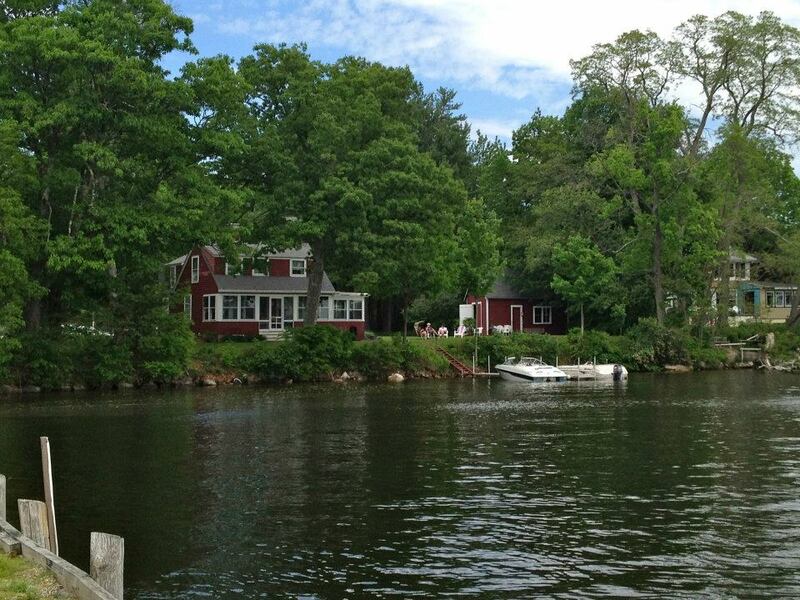 Part of that comes from my summers spent at lake Winnipesaukee. My mother would always be taking us for walks and you could guarantee ever morning she would be walking “the loop” that would end at Melvin Village’s Country Store or Hansel & Gretel’s gift shop. We usually would be buying a treat, or a staple food item like milk for our cereal or marshmallows for the S’maores. On our walk back was a small, rickety vegetable stand set up in someone’s front yard. It was an old red wagon with a tattered green and white awning shading the fresh vegetables. The stand was self serve. You would drop your money in the tin jar and pick out the best looking summer squash and pattypan to enjoy with dinner. As a kid I was fascinated by the idea of trusting everyone to pay and not swipe the jar, but the system worked summer after summer! My mom would prepare the squash so simply. Thinly sliced, salt, pepper and a touch of butter, wrapped in tin foil and cooked on the grill. 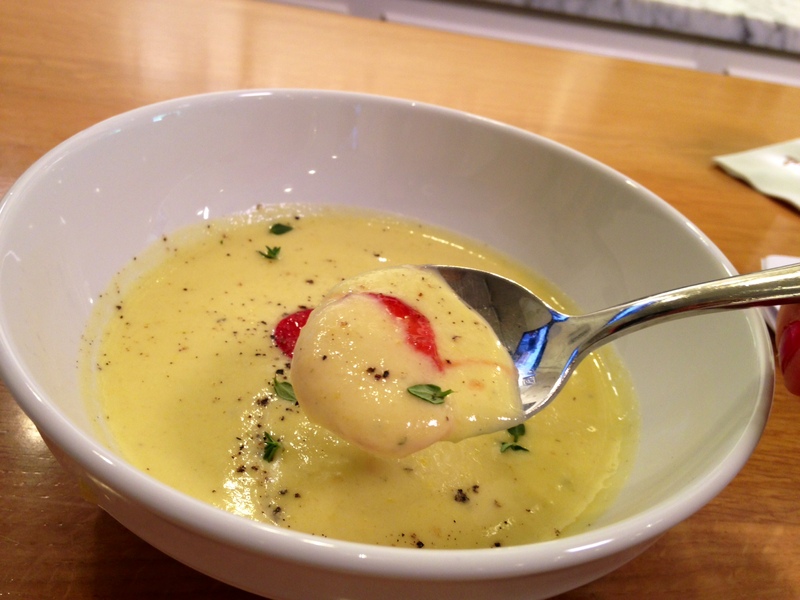 This Yellow Squash Soup with Cured Strawberries is simple just like my mom’s summer squash and it perfect on a hot summer night. 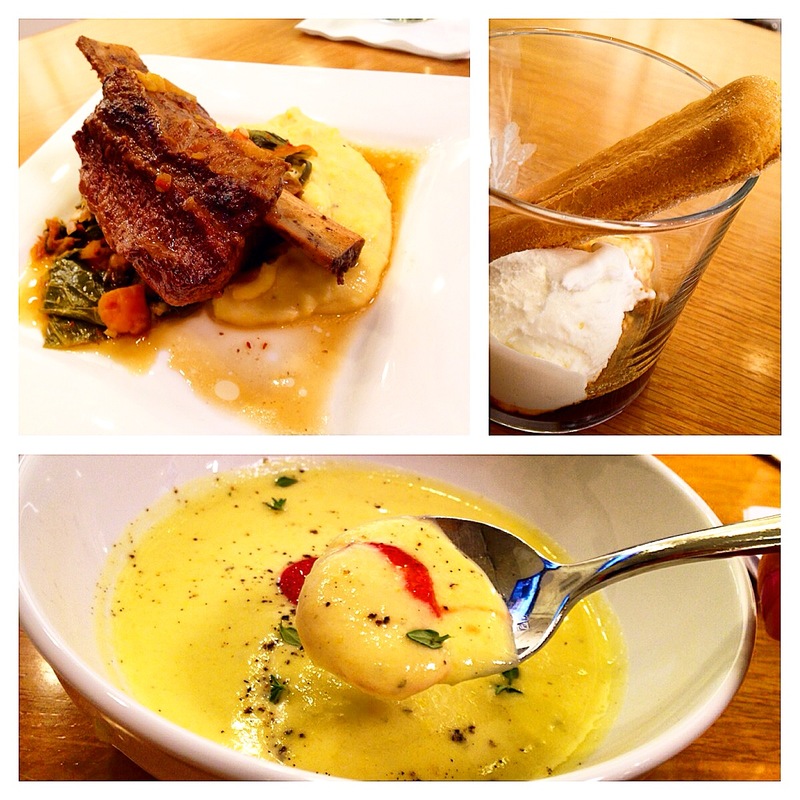 Simple ingredients, bold flavors, spices, stories and people are the key ingredients in making food memories. 1) To make the soup: Heat the olive oil in a large skillet over medium heat. Add onion and cook until translucent, about 2 minutes. Add the yellow squash and thyme and sauté for 3 minutes. Add the vegetable stock and bring to the boil. Simmer for 10 minutes, or until the squash is soft all the way through. Take off the heat and let cool for a few minutes. 2) Transfer the soup to a blender, add the sour cream and salt, and puree on high until very smooth, about 2 minutes. Check the consistency; if the soup is a little gritty, strain it through a fine mesh sieve. Chill in the refrigerator for at least 2 hours, or as long as overnight. This entry was posted in Quick & Healthy, Soup and tagged Comfort food, Cooking, Dinner, Food Memories, Homemade, Soup, Stonewall Kitchen, Summer, vegetables. Bookmark the permalink.